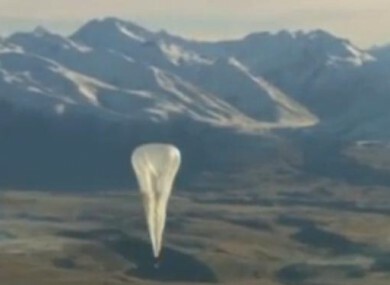 Google is launching balloons into near space to beam internet access to the world below. GOOGLE REVEALED TOP-SECRET plans today to send balloons to the edge of space with the lofty aim of bringing Internet to the two-thirds of the global population currently without web access. Scientists from the technology giant released up to 30 helium-filled test balloons flying 20 kilometres (12.4 miles) above Christchurch in New Zealand today, carrying antennae linked to ground base stations. While still in the early stages, Project Loon hopes eventually to launch thousands of balloons to provide Internet to remote parts of the world, allowing the more than four billion people with no access to get online. It could also be used to help after natural disasters, when existing communication infrastructure is affected. Balloons, carried by the wind at altitudes twice as high as commercial planes, can beam Internet access to the ground at speeds similar to today’s 3G networks or faster. It works by ground stations connecting to the local Internet infrastructure and beaming signals to the balloons, which are self-powered by solar panels. The balloons, which once in the stratosphere will be twice as high as commercial airliners and barely visible to the naked eye, are then able to communicate with each other, forming a mesh network in the sky. Users below have an Internet antennae they attach the side of their house which can send and receive data signals from the balloons passing overhead. Some 50 people were chosen to take part in the trial and were able to link to the Internet. Richard DeVaul, chief technical architect at Google (x), cautioned that “it’s awfully too early to think about covering the entire planet”. We think hundreds of balloons, maybe 300 or 400, might be necessary to complete that ring. Google did not say how much it was investing in the project. Project leader Mike Cassidy told reporters that if successful, the technology might allow countries to leapfrog the expense of installing fibre-optic cable. “It’s a huge moonshot, a really big goal to go after,” he said. Email “Living in a remote part of the world? Google wants to get internet access to you with balloons”. Feedback on “Living in a remote part of the world? Google wants to get internet access to you with balloons”.